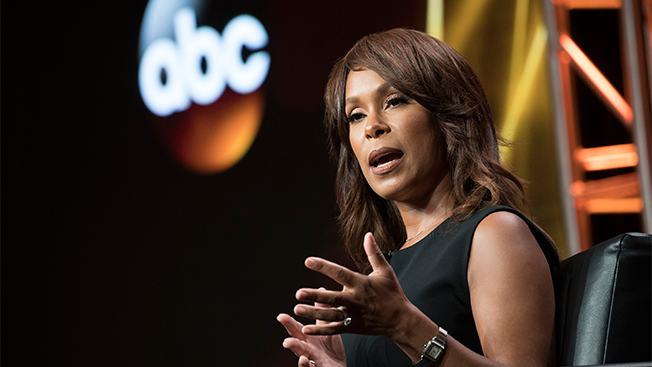 Channing Dungey has been ABC Entertainment president for just six months, but she's already mastered an essential element of the job: Keep your network's most important producer happy. With that in mind, ABC had made an important decision regarding its successful TGIT branding of its Thursday night dramas, all of which have been produced by Shonda Rhimes for the past two seasons. It's holding off on using "TGIT" until Scandal returns in January. (The drama was pushed to midseason this year to accommodate star Kerry Washington's pregnancy.) This fall, Thursday night will feature the first non-Rhimes-produced show in three years, with Notorious filling in for Scandal at 9 p.m. While TGIT "was an ABC marketing strategy," it has become synonymous with Rhimes and her shows. The most successful TGIT lineup includes Grey's Anatomy, Scandal and How to Get Away With Murder. Rhimes indicated earlier this year that TGIT wasn't TGIT without her shows, tweeting about the next of May's finales, "This is the final night for #TGIT until 2017! See you for #GreysAnatomy and #HTGAWM in the fall!" Dungey confirmed to reporters at the Television Critics Association's summer press tour in L.A. that ABC will indeed honor her wishes and keep TGIT in mothballs until January. This was Dungey's first TCA as head of the network, and she admitted she was "a little more nervous" than when she first spoke with the press to unveil ABC's new schedule in May. Dungey, who replaced Paul Lee as ABC Entertainment president in February, said she was taken aback by the timing of her promotion. "Coming in in the middle of pilot season was challenging," she said. "It happened very quickly, but I'm very grateful for the opportunity." She has her work cut out for her: The network fell to fourth in adults 18-49 last season, though Dungey said ABC was tied (with NBC) as the No. 1 entertainment network (which, as we must always note, is not an actual thing). And the network has had a successful summer with its Sunday Fun & Games lineup of game shows Celebrity Family Feud, $100,000 Pyramid and Match Game, all of which have been renewed for next summer. "We're very proud of our brand," which reflects America "authentically, in all its diversity," Dungey said. This season, Dungey's goals were to strengthen 10 p.m. and to come up with "more buzzworthy, must-see shows." She may have accomplished both with Designated Survivor, the network's new Kiefer Sutherland drama, which people have been buzzing about since ABC screened its first act for advertisers and buyers at May's upfront. She also has high hopes for her new drama Conviction. "We have been looking for a while to find what we think is the perfect next iteration of the ABC procedural," said Dungey, who wants to see more closed-ended procedurals on the network because it's easier to produce 22 episodes of those each year (as opposed to serialized shows), plus those episodes fare better in repeats. On the comedy side, the network had been looking for a project featuring a special needs child, which was one reason it gravitated toward Speechless, starring Minnie Driver, which has also been generating good buzz going into the fall. American Crime, a pet project of Lee's, is "close to my heart," said Dungey. The series "didn't hit our target" in linear but did "pretty well" in multiplatform, she said. Still, it's important for the network to have some shows "that we believe in creatively," she said, adding that she hopes Season 3 will "broaden the base … it's all about the launch and the marketing" to build momentum. Dungey announced a straight-to-series pickup of a thriller called Ten Days in the Valley, starring Kyra Sedgwick, which will air sometime in 2017. Each episode unfolds over a single day in the 10-episode season, and future seasons may or may not adhere to the same formula. On the over-the-top front, "we are committed to getting our content to our audience in as many ways as possible," said Dungey, who touted ABC's app relaunch last month. Looking ahead to the future, Channing said the network is in talks with fellow Disney companies Marvel and Lucasfilm about bringing new Marvel and Star Wars-themed shows to the network.